Nutribullet Max Review - Is it Better than Nutribullet Pro ? Nutribullet Max Review – Is it Better than Nutribullet Pro ? Nutribullet has the best selling line of personal blenders and one of their newest model (launched in late 2016) is the Nutribullet MAX . In this Nutribullet MAX review, I will explain how it compares to other Nutribullet models and if the higher price is worth it. 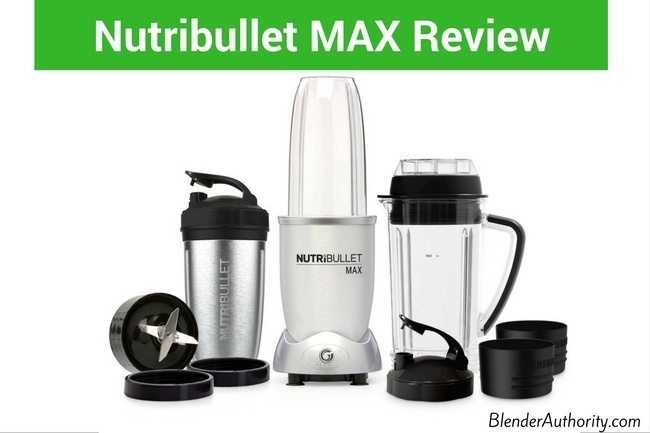 If you are new to this site, I should mention that I use Nutribullet blenders and have written detailed reviews of the other Nutribullet blender models (Nutribullet 600 vs 900 vs Rx) and Nutribullet LEAN and Nutribullet Select (NOTE – I do compare the Nutribullet MAX to other Nutribullet models in the review below). The Nutribullet MAX (Model NB12-1201) is a mix of features from its other models. In fact, if you compare the new Nutribullet LEAN vs Nutribullet MAX, you will see that they are the SAME blender. The difference between the Nutribullet MAX vs LEAN blenders is simply the accessories. The Nutribullet max comes with a 12 piece set that includes: 1200 watt blender base, 1 extractor blade, 32oz colossal cup, 1 stainless steel travel mug, 1 liter pitcher, and various lids. The Nutribullet MAX the has the popular jar design of the Nutribullet 900 but the MAX is more powerful at 1200 watts. The MAX’s 32oz capacity is the same as the Nutribullet Pro and Nutribullet LEAN blenders. The unique feature of the Nutribullet MAX is the pre-programmed Autocycle technology. The Autocyle is simply a series of programmed short and long pulses that helps to move the ingredients around more thoroughly. The auto on/off feature means it will shut off from blending after one minute. Personally, I don’t care for the programmed technology, but I like the addition of the 1 liter pitcher which loads from the top like a conventional blender. The 1200 watt motor is plenty of power for a personal blender but does it work ? The Nutribullet MAX is very new so there are very few reviews . I don’t see much in design difference to see why it would perform much better than the 900 Pro. The Nutribullet MAX has a newly designed extraction blade(it looks similar to Ninja blender blade) but it is hard to say if it performs better than the older extraction blades . To see the MAX blender “Autocycle” in action, skip to the 4 minute mark in the video below. Overall for performance, the 1200 watts adds a nice boost relative to the 900 watts of the Nutribullet Pro for the same size 32oz container. The blade is very sturdy but I am not sure if the higher power and new blade make much difference in blending performance. Positives: The new liter-size pitcher(similar to the one with the Rx) is a nice addition so you can add easily add ingredients to a smoothie from the top rather than having to unscrew the blade every time. This is convenient if you want to add protein powder or more liquid to a drink after initial blending. The 1200 watts is plenty of power to blend any smoothie recipe. It doesn’t require the big jars and tools required on the Rx model. (Some people have a hard time unscrewing the blade from the wide Rx jars). Negatives: While some people might like the Autocycle blending program, I don’t like it. I would rather have manual control. The Nutribullet 600 and 900 models have no pre-programmed features so you just twist the jar to pulse, turn on, and turn off. You can see from the video above that the one-touch blending program is sort of unnecessary and you would be fine without it. The other negative is the price is as much as 50-100% higher than the 900 pro and 600 models. One small design negative is that the Nutribullet MAX uses a new extractor blade design. The MAX extractor blade doesn’t have the flat lower blades which is disappointing because the the flat blade work better at grinding and milling dry ingredients. The Nutribullet LEAN is very similar but provides accessories oriented around weight loss. 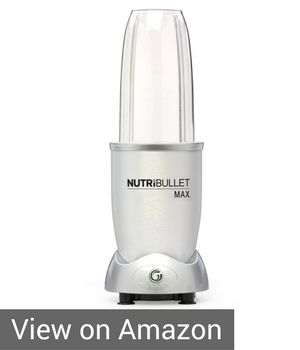 It is cheaper than the Nutribullet MAX because it doesn’t have the extra larger jars that come with the MAX. (Also, I am sure Nutribullet priced the LEAN lower because they sign people up to a monthly autoship program for their LEAN boost powder). The LEAN has a full weightloss plan included vs the MAX is just a blender with more jar accessories. The Nutribullet Rx is the most expensive Nutribullet model with larger cups (they are not compatible with other Nutribullet models) and a powerful 1700 watt motor. The RX has a larger capacity due to its more powerful blender. The Rx was the first Nutribullet model to add a pre-programmed blending feature which they called “SMART” technology. Also, the Rx is the only model with a built-in heater that will heat up blending ingredients. While the RX has very high reviews some people don’t like the wider cups and the fact that you have use a wrench to tighten/loosen the blade from the jars. The RX is only slightly more money than the MAX with similar features, but the RX has more power and a built in heater. If you don’t care about the autoprogram function, then the cheaper Nutribullet PRO 900 is a good choice as the 900 watts is usually enough power for blending with a 32oz capacity container. The Nutribullet MAX has more power with 1200 watts versus the Pro’s 900 watts. Other than that, the MAX adds Autoblend functionality and the Nutribullet 900 (and “Original” 600 model) have no preset programs. The MAX adds a nice 1 liter pitcher which I hope is added as an accessory for the 900 Pro soon. The Nutribullet MAX costs 50% more than the Pro so you have decide if having the pre-set programs and slightly more power is worth it. Personally, I prefer the Pro 900 because I don’t want electronics that can just break. You can easily pulse and on/off with a quick twist of the jar on the 600 and 900 Nutribullet models. The difference in blending power between the MAX and 900 isn’t noticeable enough for me to pay 50% more. Also, I prefer the Pro 900 extractor blade design which grinds and mills dry ingredients better. Another option if you really want the preset blending feature is I like the Nutri Ninja Auto IQ. The Ninja BL482 is much less than the Nutribullet MAX (see my Nutribullet vs Ninja Auto IQ post for more details). The Nutribullet Select was introduced in Spring 2017. The Nutribullet MAX has more more power than the Nutribullet Select 950 watt motor. The containers provided are very similar and no major difference. The biggest advantage of the Nutribullet Select is that it has Nutribullet’s newest controls and is the only model with variable speeds, on/off dial, and pre-programmed choices. I prefer the controls and features of the Nutribullet Select vs. the Nutribullet MAX. In summary, the Nutribullet MAX is OK but not my favorite. It has nice power and accessories for making smoothies, but I don’t really like the Autoblend preset program. I also prefer the traditional Nutribullet extractor blade design. I personally think the Nutribullet Pro offers the best “bang for the buck”. Also, the few reviews I found on the Nutribullet MAX were mixed with a couple complaints about the Autoblend programming not working well. Thank you for providing clarity on the complexity of these products. I have a leakage issue with the RX which I received as a gift, and have only used for a week. After reading your information, I at least understand which model I am dealing with, and intend to call Nutribullet. Hello Anita, thanks for the comment and I am glad my information helped. The Rx has been known to leak for some people but many times it can be fixed easily by using the wrench that comes with the blender. If you use the wrench to tighten/loosen the blade bade then it should help. The Rx is the only one that comes with the wrench because the wider blade/cup base makes it harder to do it by hand(hard to wrap your hand around it). My new Nutribullet Max button does not work as shown in this video. Mine simply goes on with green button lite and no pulsing just extraction the entire minute. I am not happy….where do I g to get some help with this? Thanks. A. Follow the Classic NutriBlast Mode directions. powering off . If the Power Base does not stop after one minute, unplug it and call Customer Service. Extremely helpful and comprehensive comparison as I pick my next smoothie blender. THANK YOU ! HI, i tried a juice from the RX 1700 but will the Nutribullet select do the same consistency juice/smoothie as i dont make soups so i only want to blend..
Hello Kim, the Rx will blend fibrous vegetables a little finer but you can just run the Select a little longer. It won’t be dramatically different. Thank you so much for your reviews with videos. I have been researching the NutriBullet blenders for a good few hours and like you I disliked the same features on the more expensive ones. But reading your reviews and watching your videos have sooo helped me choose. You’re a star ⭐️ I’ve always wanted a NutriBullet and never knew which one to buy, now I know I’ll buy the Pro 900. Thanks again, your help has been much appreciated! Hi Sinead, I am so glad that you found our information helpful. We are constantly trying to provide the best reviews possible. Thank you for your review. I currently have a NutriBullet 900 we use it 4-6 times daily and makes wonderful smoothies we all love trying new combinations. And I finally have my girls willing consuming more Vegetables. However the machine is very noisy, would using the NutriBullet max or 1200w machines be quieter because the bigger motors aren’t working as hard? Hello Suzanne, Sorry they are all similar noise levels with the same design.